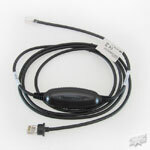 Cable, RS-232, Black, DB-9 female, 2.9 meters (9.5'), coiled, 5V external. See MX009-3MA7S or MX009-3MA7C for USB keyboard emulation or MX009-3MA8S or MX009-3MA8C for USB Serial emulation. Call for details. 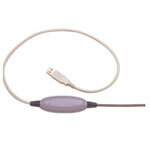 USB HID Cable, Coiled, Dark gray, for the MS9540/20, MS6520, MS7120 and MS7220. Made to order with 6-8 week lead time. 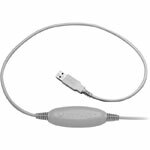 Keyboard wedge cable (7 feet, straight) with power input port for the MS7120, MS9535 and Voyager series. Power supply not included, see (Part# 45-45593). Color: Black.